If you are looking for a unique way to enhance the look of your outdoor living space, adding a pergola to your patio design is a great way to do so. Pergolas are a great way to define and expand your existing outdoor area, as they virtually add extra room. 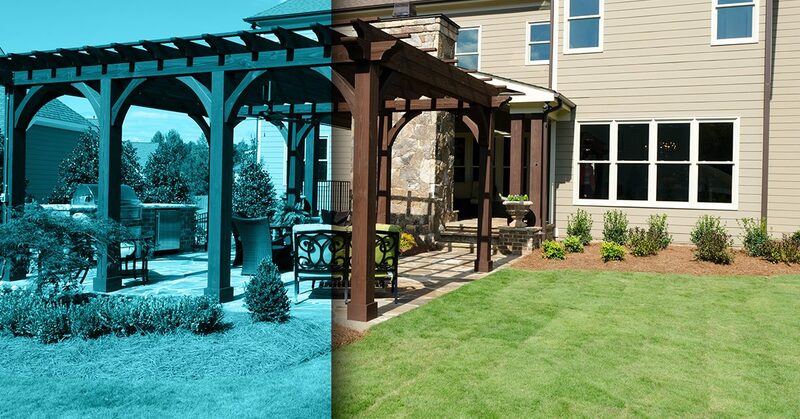 Pergolas have become a staple of breathtaking outdoor living spaces. Many pergolas in Dallas and the Fort Worth area can be used to create an area for an outdoor kitchen, a spot for entertaining guests, or simply an area for relaxation. At Compass Outdoor Design, we specialize in designing and building beautiful outdoor living spaces for your home. Our patio designers know how much a pergola can change the way you see and view your backyard, so it is essential to consider how you might want the structure to affect your yard before deciding on one. To get the most out of your pergola, it is important to consider five ways a pergola may influence the functionality of your landscape. Even basic pergola styles have the ability to create an outdoor living space with its roofing grid and strong support beams. These beams and roof rafters can either be left open or covered, providing a sheltered area that protects the area from adverse weather conditions. This may be one of the most important features of pergolas. These structures help define a previously vague, open space and create a sense of enclosure, making it seem as if you have entered a new living area of your home. Pergolas provide just the right amount of shade for decks, patios, and other outdoor predefined spaces. When your home has one of these spaces, for added comfort, you may be interested in adding some shade to the area. Traditional pergolas with open beams across the top create a stationary, roof-like structure that provides some relief from the intense sun. Pergolas add some privacy to your homes outdoor space. With a roof-like structure blocking the view from above, it will provide more privacy than a patio or deck would. Not to mention, drapes, screens, and other materials around the perimeter of a pergola can add some extra privacy. Pergolas provide the ideal space for outdoor entertainment. Great for keeping outdoor furniture dry and safe from poor weather conditions, ensuring your entertainment space is always ready for parties and gatherings. Rather than keeping guests inside during a summertime gathering, you can enjoy the great outdoors and fresh air thanks to pergola installation. As outdoor living in Dallas continues to grow in popularity, a pergola will make an excellent investment for your home – they are a smart, cost-effective, and simple way to increase the value of your home. For the best return on investment, make sure you work reputable pergola contractor to design and build this outdoor living space feature using high-quality materials to ensure longevity. The outdoor areas of your home have plenty of potential for expanding your living spaces. A pergola can be attached to a home or used as a freestanding structure with open sides and a semi-covered or shaded roof. Adding an outdoor fireplace, grill, or outdoor kitchen to a pergola is great for every season and can extend the use and functionality of your outdoor living space. If you decide to add a structure like a pergola, deck or patio, be sure to contact the patio designers at Compass Outdoor Design to handle the project.